Is bedtime chaotic at your house? It can be at mine! Help your kids get into a routine to have a more healthy life. When they have an established routine or a list of tasks, they know what to expect and it helps break the cycle of nighttime meltdowns. We were inspired by a number of bedtime routines that we found through Pinterest (did you know there were whole boards devoted to the topic?) and created our very own dry erase board. This post is sponsored by LISTERINE ® Brand. We have been long-time users of their products – the following review is my honest opinion of their kids’ mouthwash, LISTERINE ® SMART RINSE ® . We were compensated for this post. My daughter is eight, and my son is seven. They *love* following rules and this list was the perfect thing to help them be a bit more independent. They pick up their toys. Get their jammies on (sometimes). They lay out their clothes for the next day. The kiddos brush their teeth (and floss). AND… they rinse their mouths with LISTERINE ® SMART RINSE ®. We had been using LISTERINE ® TOTAL CARE ZEROâ„¢ for a while as my kids have teeth “issues” so we need a little extra to keep their mouths healthy. 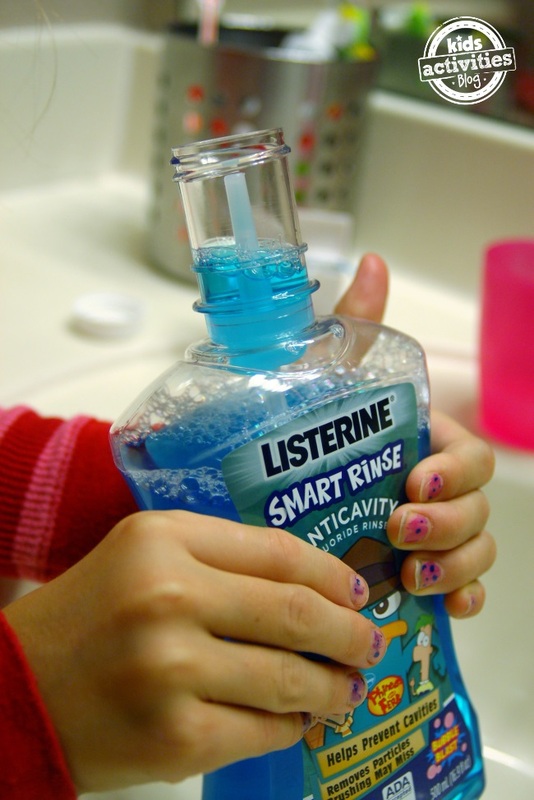 This product can be used with kids six and older (with adult supervision) and while we liked it, we recently made the switch to LISTERINE ® SMART RINSE ®. Similar to LISTERINE ® TOTAL CARE ZEROâ„¢, this formula has no alcohol, but what we really like about it is the bottle, which is built to control the portion your kids can use. The bottle squeezes instead of pours and your kids can only get 10 ml of mouthwash out at a time. If only flossing were this easy! 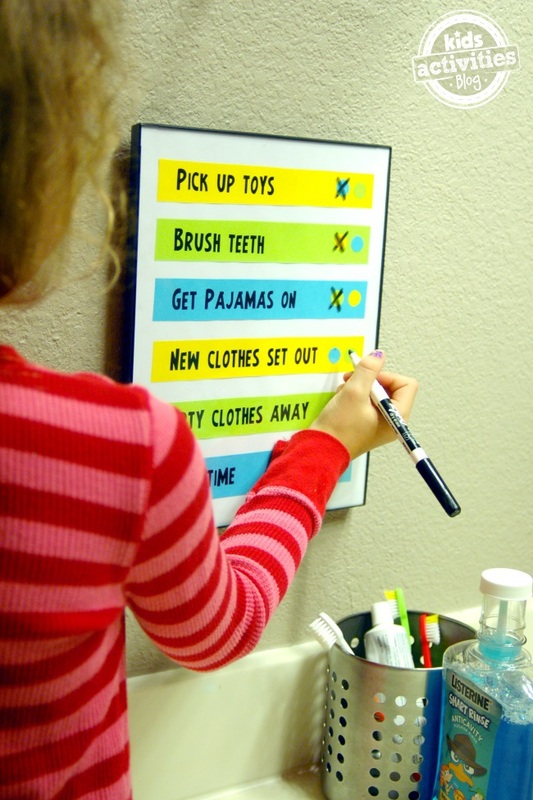 To make our Bedtime Checklist we printed up our list of tasks – we used three colors of paper for fun – then cut the tasks into strips. If you don’t like the tasks we have, make your own. Glue the strips to a white page. 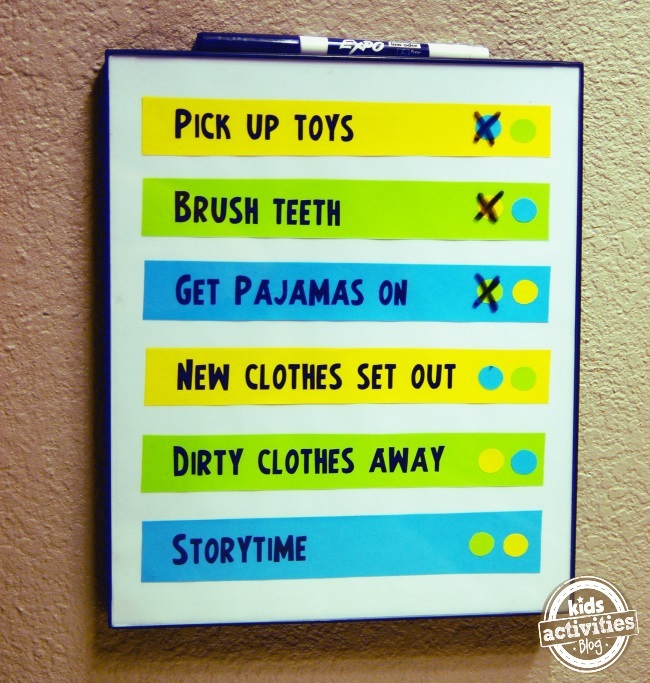 Add circles for your kids “check-off” boxes. Stick your page inside a document frame. Add a dry erase marker – and viola. Your kids are one step closer to managing bedtime on their own!